This is an advantage. I need to address it specifically because resting the shield on the shoulder has has been put forth by the pro-othismos (pushing match) authors to partially explain why the shield has its characteristic concave shape. Once I am finished presenting my new model for othismos in the next few posts, I will have to deconstruct the current, incorrect pro-othismos arguments. The development of the double-grip as a means of bearing the weight of the shield I will adress in coming posts, because it is tied to the shield's true function, but I'll discuss the idea of the rim as a shoulder-rest. The apis can be rested on the shoulder. The logic behind citing this as a reason for the concavity and rim is as follows. The aspis is heavy and held in a double-grip that does not allow it to be put down easily, so a rim was added to allow it to be rested on the shoulder. There are problems with this logical progression. The aspis is heavy, but much of the weight is added by the thickest part of the shield, which is the thickened shoulder section near the edge and the off-set rim. Thus the means of carrying the weight is responsible for a good portion of it. 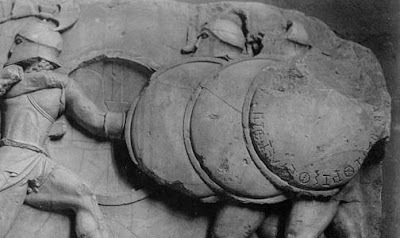 Throughout Greek history we see many heavy shields. Large Mycenaean shields appear to have aided in carrying this weight by the use of a shoulder-strap or telamon. The smaller, but still robust shields of the later Macedonians is also equipped with a shoulder-strap. Were bearing the weight of a heavy shield the only concern, the use of a simple strap makes far more sense than an unique, heavy shoulder rest rim structure. Resting the shield on the shoulder is surely something hoplites did to bear its weight, but this function arose as a consequence of the heavy, offset rim, not as its source. As an analogy I put forward the wearing of corinthian helmets pushed back off the face and held in place by its cheek-pieces. In high school we used to wear our football helmets in this way whenever possible because, even with modern ventilation systems, the difference in heat is enormous. No one would suggest that the cheek-pieces evolved in order to be worn in this manner, the protective function to the face and neck is obvious. It is only the fact that the benefit of the aspis' unique shape is not obvious that allows such conjecture. As an aside there is an excellent reminder of the power of fashion in the design of military equipment. 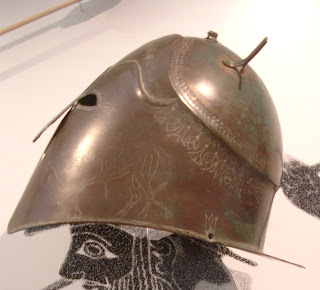 In Italy, magna graecia, we see a type of helmet known as the Italo-corinthian that is designed to look like a corinthian helm worn in this way, but cannot be worn pulled down. There is no functional reason for this, the faux eye-slits surely weaken the structure, but the force of fashion is strong. The aspis has a number of features that, if not unique, are unique in combination. The shield is round, convex in profile and somewhat dome-shaped, it invariably has a robust, off-set rim, its cross-section appears to be thicker at the outer edges than in the center, a rope runs through rings fixed around the inner shield-face, and is carried on the forearm. The wearing of a shield on the forearm with a double-grip is not unique, but it is uncommon for an infantry shield. Cavalry gain from having a second hand free to hold reins, and shields that developed out of cavalry shields may retain this feature. Infantry that are expected to bear a two-handed weapon, or peltast skirmishers, who bear javelins in the left hand, will benefit from a double-grip as traditionally seen in the pelta. 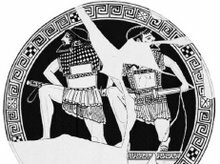 It is possible that this was the original explanation for the double-grip in the ancestral aspis, for early hoplites appear to have been armed with two spears: one to throw and one to fight with. In hand to hand combat there is little to gain from affixing a shield to the forearm and much to lose. A shield on the arm cannot be brought to bear across the body with the facility of a single-grip, one handed shield held. The heavy shield cannot be simply rested on the ground during lulls in combat. It cannot be used as effectively to punch, the forearm shiver being weaker, nor can it hold off a foe at "arms length." There is an effect of the distance a shield is held from the body which will be familiar to fencers. As shown at left, the increased distance between the shield and body (B) cuts down on the angle of attacks that are able to reach a defender compared to a close-held shield (A). From a protective standpoint The double-grip adds little. If we look at a cross-section of the aspis, we see that it is somewhat dome shaped and the thickness is greater towards the rim than in the center. This is peculiar in a shield because they are normally thickest in the center, providing maximum protection to the core of the body behind them, and taper towards the edges. These structural elements were not seen in the world of ancient Greece, though they would be common a few centuries later. They are the elements that make up a load bearing arch, such as the Roman aqueduct at right. If it is an arch in cross-section, the complete aspis is a dome. A dome is the most efficient shape for bearing weight, and, though not seen in ancient Greek architecture, has been a feature of construction since its discovery. 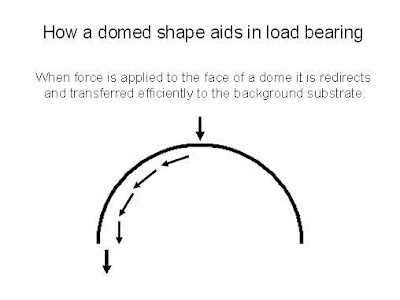 A dome works by transferring force downwards from the apex of the structure to the substrate on which it stands- the ground in the case of a building. The diagram below shows the process of transferring force. You can see that to function efficiently the dome needs to be rather steep sided. The aspis was not so convex, its shape is called a "shallow dome". 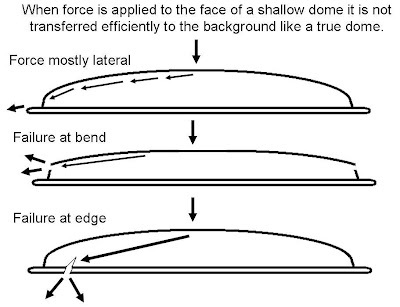 Shallow domes do not work as efficiently to transfer force through the structure. They are likely to collapse in the center, simply popping inside out like a pop-top or an umbrella in the wind. Also, because the much of the force is directed laterally instead of down into the substrate, the edges are likely to split as the material is force outward on all sides. Below are some ways in which a shallow dome fails. There are ways to support a shallow dome that can counter this tendency. A heavily reinforced rim will keep the edge of the shallow dome from "kicking out" laterally and prevent failure. reinforcement of the inner face of the shallow dome is accomplished by a truss. In architecture this is usually accomplished by steel cable, but it can be a solid metal reinforcement as well. A truss acts by countering some of the lateral force. By connecting two points in the structure with the truss, the pressure on one side forcing outward will pull the truss to counter the outward pressure on the opposite side. By placing a truss at the point of maximal stress, the structure can be reinforced. A truss placed higher towards the apex will aid in this manner and keep the face of the shallow-dome from collapsing inside out. Diagrammatically I show the truss as a cord or band running across the shield, but a truss can also run around the inside of the structure and have the same effect. The aspis displays these features that allow a shallow-dome to bear maximum weight. The first and most obvious is the robust, and more importantly, off-set rim. The rim is off-set to provide the maximum resistance to the force that would cause the edges to be forced apart. The thick wood is enhanced by the common addition of a metal reinforcement. This add the tensile strength of the metal to the structure as the metal resists being stretched outwards. As can be seen in the above diagram, the aspis has a zone near the edge where it becomes steep. This area is particularly vulnerable because the change in angle means that it will bear much of the lateral pressure. Not surprisingly it is the thickest section of the shield. There are two features which are commonly seen in the aspis that may also support the shallow-dome. There are metal bands seen running around the inner surface of many shields in art, and some examples have been excavated. These bands are too narrow to provide protection from penetration, but are firmly affixed to the shield's inner surface and may act as a truss. They can be seen closer to the apex and at the point of maximal stress near the edges. There is another feature that is seen on almost all hoplite shields. The grip, or antilabe, is a segment of a chord that runs around the inner surface of the shield through rings affixed precisely where we would expect to find a truss and by running loose through rings would share tension across the shield. The function of this rope is unknown. Images of men apparently using this rope as a sling to carry the shield exist, but the elaborate system, unique the the aspis, seems over-built for this function alone when we consider that the telamon, shield sling, had been around for centuries. Some images show this rope and a separate sling in place. Against its use as a truss is the fact that it is generally shown slack. It is possible that by the date of the images we have the truss was no longer functional, but a decorative holdover from a past functional truss rendered unneeded by better construction techniques and supplementary reinforcements like those above. Another explanation may stem from the fact that the truss cannot be left under tension or the rope will stretch and loosen. Artists painting from an aspis model in their workshop might simply be painting untightened trusses. Such rope trusses were not unknown to the ancient Greeks. they are a common feature in ship construction known as upozwmata. They may stretch across the ships beam as shown at left, or run fore and aft to prevent what is known as "hogging", where the ends of a boat droop in relation to the center. This force on the center is analogous to the force on the face of the shallow-domes above. The Latin term for these trusses, tormentum, implied another feature. They cannot be left tight, but must be twisted tight before a ship sails. In the next post I shall show how the fact that the aspis is a load-bearing structure determines the nature of hoplite combat. What is the benefit of a curved shield? Shields with curved profiles are common, but there is a wide variety in their profiles and the benefits they convey. As shown in the previous post, Assyrian shields were cone-shaped in profile. The sloped shield-face provides increased protection from penetration in a manner that will be familiar to students of the development of WWII tanks and the advent of "sloped armor." Simply because for any thickness of a plane of armor a diagonal path through it will always be longer than a perpendicular path straight across it, a sloped shield acts as though it were thicker than it actually is when blocking a frontal attack. Another famously curved shield is the Roman scutum. The example at left is from Dura Europos, the image is from the Yale Art Museum, and clearly shows the hemi-cylindrical shape. As well as the sloped-armor effect, curvature can provide enhanced protection from chopping attacks. This one is a little more complicated, but obvious if we understand how weapons are designed to cut. The whole reason for a fine "edge" on a sword or axe is to transfer the total energy of a thick, heavy weapon to the target through the minimum area of contact. This focusses the force and allows cutting. With a flat shield, a chopping sword will impact the rim along only a few millimeters of razor-thin edge. The way to avoid this is to try and hold the shield-face parallel to the incoming blade, but this is difficult to do consistently. If the sword strikes along the shield-face instead of impacting the rim, then rather than a few millimeters of edge, much of the length of the sword will strike simultaneously. You might think that this is irrelevant since the edge is sharp, but the total area over which the force is transmitted increases. This is conceptually the same way that even long, narrow skis spread ones weight over the surface of soft snow and allow it to be passed over. As shown below, a curved shield provides less protection than an impact along the whole shield-face, but much more than the rim alone. The true benefit is that you do not need to try and intercept the incoming blow with the flat of the shield, a strike cannot avoid it. The aspis can benefit from both of these effects, but it is poorly designed to do so. It has a relatively flat face when compared with the Assyrian shield, so much of the face is not appreciably sloped. The curved "shoulders" of the aspis are confined to a narrow band just before the rim, so the benefit is confined to blows striking the edge. The fact that the aspis invariably posseses a robust, often metal sheathed, offset rim make added defense against chopping strikes to the rim a low priority. The aspis seems to not have been designed to capitalize on protective advantages of a curved shape, so why was it so characteristically curved? In the next post I shall examine the shape of the aspis in detail. The answer to Goldsworthy’s challenge lies in understanding the hoplite shield. It is often referred to as a hoplon, but the term hoplon can refer to any implement of war. 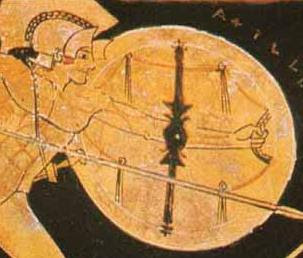 The specific term for shield is aspis and the shield we are concerned with is known as the Argive aspis, although the connection to Argos, either as originator or mass-producer, is unclear. Before showing what it does, I must describe what it is. In this first post I will discuss its construction and characteristic features. The shield may have originated as early as the late 8th or early 7th century B.C. and survived in nearly identical form for at least three hundred years. Round to slightly oval in outline, normally 80 cm to 1 m in diameter and about approximately 7.5 kg weight, its characteristic features are a convex profile and a robust, offset outer rim. Nick Sekunda, in his Osprey title on hoplites, describes an Etruscan example in the Museo Gregoriano of the Vatican that appears similar to Greek examples. It was constructed of 20-30 cm poplar wood planks glued together horizontally to form a solid block, then turned on a lathe to form the characteristic shallow dome shape that left the flattened center of the core thinner than the curving outer edges. This shield has a diameter of 82cm, a depth of 10 cm and a 4.5 cm off-set rim reinforced with wooden laminates. The shield’s inner face was usually covered with leather and sometimes highly decorated. The face of the Vatican shield is covered in a seamless 0.5 mm layer of bronze that overlaps the inner face of the rim by 4 cm. This fully bronze-faced front of the shield is commonly portrayed, but archaeological finds show that bronze plating of the rim alone, perhaps with a bronze blazon, was more common. Shields represented on the 7th century Chigi vase appear to be made of layers of thin wooden laths. Wicker was another possibility for early shields, and into the classical period bronze shield-rims often display a characteristic Guilloche style that is a stylized woven pattern. This may hearken to a time when the shield itself was woven. The aspis was supported by a double-grip system. Near the center of the shield’s concave interior was a bronze loop, the porpax, through which the left forearm was placed to bear the weight of the shield. The porpax was secured to the shield’s inner face by long vertical bronze straps. This structure could be one piece or made so that the armband was removable, as the Spartans are said to have done to render their shields unusable to rebellious Helot serfs. A second grip, the antilabe, was for the left hand and was placed near the rim. The grip was a pair of metal staples through which a rope passed that traveled through four or more metal rings spaced around the inside perimeter of the shield. This peculiar shield’s evolution is not well understood. Round, bronze-faced shields were common in the region prior to its appearance, but these were generally single-grip and did not display the twin features of domed shape and off-set rim. 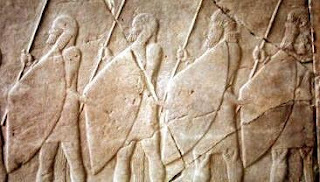 Assyrian infantry (below) carried large, deeply convex shields of bronze, but they had a single, central, grip and were cone-shaped. Urartian bronze shields, which have been excavated at Toprakkale near Lake Van in Anatolia, were domed with offset rims. Their diameter, 77 cm to 1 m, differed little from hoplite shields. These had a triple-grip system that has been interpreted to be a single hand grip and two points of attachment for a neck strap or telamon, but may have influenced Greek design. 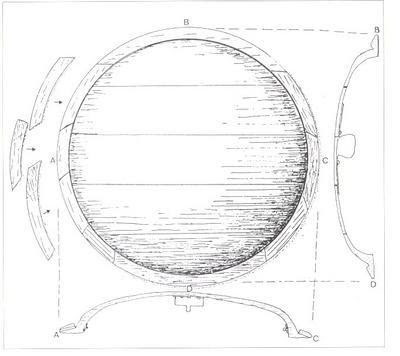 In the next post I will discuss the function of this dome-shaped shield. I'm often asked: "What happened to Sparta after her loss of hegemony to the Thebans?" I thought I would post a quick review of later Spartan history. The Thebans put an end to Spartan Hegemony and "free" the helots of Messenia (those in Laconia remain), sealing the deal with the creation of the city of Megalopolis to block westward movements out of Lacedaimonia. Sparta now consists of Laconian alone, but the governing system is unchanged. The Spartans decline to join Alexander's merry band. In conjunction with Persian naval elements, they lead an ill-fated war against the Macedonian Hegemony while Alexander is somewhere between Issus and Guagamela. They take over Crete and much of the Peloponnese before meeting the macedonian governor at the "Battle of mice" and losing. Sparta is left essentially unchanged, though humbled once again. Had they won we would remember Alexander the pretty good, conqueror of Anatolia. In the time of the successors Sparta remains one of the more powerful second-tier states. She loses a battle to Demetrios, but the "besieger" fails to besiege her. Between around 300BC and 250BC she lets her Agoge system falter, becoming more like the rest of greece. Areus in this period is the first Spartan king to put his face on coins in imitation of the other great kings. Sparta is still a source for great mercenary generals in this century. A notable figure early in the century is Cleonymus, a Spartiate and mercenary who fights for Pyrrus of Epirus to good effect in macedonia. Later as Pyrrus' fortunes wane, he convinces him to besiege the city of Sparta. The Spartan men are off in Crete fighting, presumably earning money, when the attack comes and the Pyrrus is defeated by the old and young men. The men then show up and they chase follow his retreat to Argos where he is killed in street fighting- by an old woman throwing a roof tile! The most famous Spartan mercenary general hails from this period, when Xanthippus leads a losing Carthaginian army to defeat the invading Romans under Regulus, changing the course of the first Punic war. Hannibal had as a tutor a Lakedaimonian as well, who wrote a now lost history of his wars. The Spartans are interesting in the mid to late 200s BC because a King, Agis, tries to undo all of their social problems by recreating the original Lycurgan system. The plan starts off well, but is sabotaged and Agis is executed. Many disenfranchised greeks in other states looked at this example favorably- their upper classes were not pleased. The Aetolians invade and take huge numbers of helots as slaves, while the Spartans are too disorganized to stop them. The Achean league under Aratus throw out the Macedonian governor Alexander from the Peloponnese. All of Greece was free of a reeling macedon at this time, it was the last, missed, opportunity for autonomy. In an odd twist of history, the murdered reformer King Agis' wife married the son of the man who did him in. She or simple political strategy lead him to attempt the same reforms. He, Cleomenes III, is very successful but brutal, casting out the other blood-line of kings and the Ephors and essentially becoming a tyrant (for good, so he says). His program is very popular with the underclasses in other cities and he threatens to topple the Achean league, the power that balances against Sparta. Aratus and the Acheans call in the Macedonians for help at the price of giving up all the gains they made in kicking them out earlier! Cleomenes builds a large army by raising about 4,000 new Spartan citizens through land reform, by buying mercenaries with subsidies from Ptolemy against Antigonas Doson of Macedon, and by freeing 2,000 Helots who can afford to buy their freedom. They meet at Sellasia on the road to Sparta and after a truly horrific and close battle, Antigonas wins. He makes a show of returning Sparta to its ancestral ways- returning the Ephors after kicking out the tyrant Cleomenes, but Sparta never truly recovers her ancestral ways. The next few decades are marked by a series of Tyrants who build up armies of mercenaries and freed helots, but they all fall. Phillip V of Macedon romps through Laconia, but like so many before him does not take the city of Sparta. The last, Nabis, who claims kingship through a tie to the long exiled Damaratus who accompanied the Persian invasion, makes sweeping "reforms"- exiling many Spartiates and enfranchising rich helots. In the end he is undone by his own Aetolian mercenaries. Sparta's independant hsitory ends here at the hands of a fellow greek, Philipoemen who "frees" Sparta from tyrrany and this time force her to become a member of the Achean league after recalling the exiles and kicking out the new helot citizens (selling many into slavery). Eventually the Romans step in, but they confirm Sparta as a member of the Achean league. Sparta flourishes under the Romans, with a number of senators coming from her citizens. She also becomes a bit of a farce, a theme park for rich romans to pretend to enjoy what the ancient Sparta was. A Spartan admiral, Eurycles, son of a Kytherian pirate, on the side of Octavius chases Cleopatra and Anthony's ship and their treasure ship after Actium. Although Eurycles makes a great show of confronting Anthony across the bows, for Anthony had his pirate father killed, in the end these spartans, unlike their forefathers, opt to take the treasure ship. Eurycles becomes a roman citizen and de facto leader of Sparta, whose boundaries are altered by Agustus. He seems to have gone on some sort of mission to Judea and intrigued there with Herod. He ends up being exiled for a time due to the protests at rome of no less a family than that of Brasidas, but ends his days in honor. His children hold high positions and his grandson is a made a Roman senator. Sparta is eventually sacked by the Goths in the 4th c AD, with many citizens fleeing south to more remote and mountainous regions of laconia. The peoponnese is heavily settles by Slavic tribes in the early Byzantine period, at least one of which, the Melingi, keeps its tribal identity into the time of the Latin conquest. The region later becomes Venetian, then Turkish, though it falls to the turks after Constantinople and for a time the Byzantine nobility flees there. The people of the Mani peninsula in southern Laconia in particular, claim to be spartans and are addressed as such even by leaders even as late as Napoleon- who oddly had as a godfather an expatriate Maniate in Corsica. The revolt from the Turks starts in the Mani, so it could be claimed that the "Spartans" once again defeated the Eastern menace to Greek Independence.